We have 2 sizes in the soprano range. The 24 string model has 2 full octaves with a range of G to G above middle C. The 30 string model has 2 plus octaves with a range of F to A above middle C.
Available with Alder, Butternut, Spruce or Walnut top. The pinblocks are hard Maple. Siderails are solid Walnut. Walnut bridge with metal rail. Celtic Knot soundhole. Black dots identify the C notes. 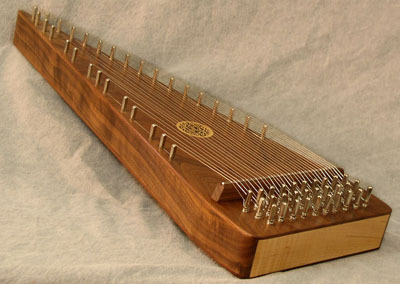 The 24 string is 18" long; the 30 string is 22" long. 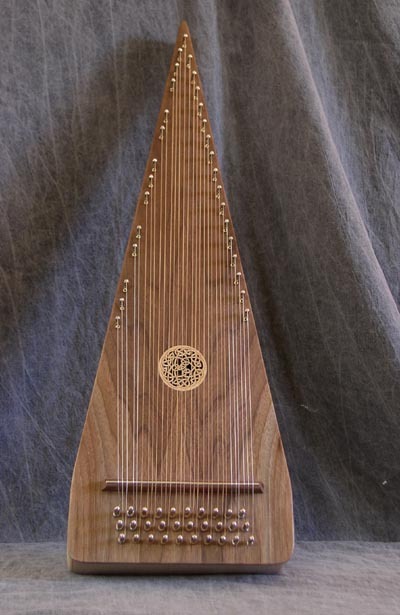 The baritone bowed psaltery is a 30 string model with 2 plus octaves and a range of F to A above middle C. Excellent sound in a manageable size. Available with Alder, Butternut, Spruce or Walnut top. The pinblocks are hard Maple. Siderails are solid Walnut. Walnut bridge with metal rail. Celtic Knot soundhole. Black dots identify the C notes. 25 inches long, 8 1/2 inches wide at the base, 4 1/2 pounds. 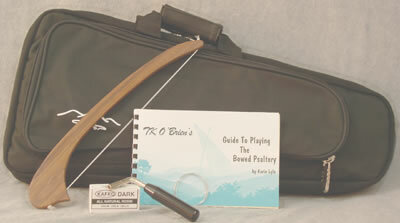 Each instrument is packaged with a walnut bow, rosin, tuning wrench, spare wire, beginners booklet "TK O'Brien's Guide to Playing the Bowed Psaltery", note guide strips, and heavy duty padded nylon carrying case with plush lining, handle wrap, and zippered pocket with bow sleeve. 3-year warranty.